Thinking about life’s experiences as my teacher is not necessarily an easy concept. For a long time, I despised every experience I had been through in life. In all due respect, I probably earned the right to despise everything. However, as I continued in my healing, I soon learned that this was counterproductive to where I needed to go in my life. I struggled for a long time pushing those experiences as far away from my mind and thought that I could. I wanted nothing to do with them. If I could disconnect and numb from them, I did. Yes, they were overwhelming and so doing this was probably my way of surviving and healing. The thing is, it came time for me to move further into my healing and that’s when I found it necessary to start looking at things differently. I began to see that what had once worked for me, was only a launching board too much more discovery. If I had held on to it as the only way through healing, I would have missed all that I have found. One of those significant things I began to learn was that my experiences were my journey. In other words, every step of the journey is the journey. When I start to frame my continued healing in this way, I begin to see much more than I have been able to see all these years. I soon discovered that my experiences and even though people who hurt me could be my teacher. No, that is not an easy one to swallow at times, and I still struggle with that. No, I’m not letting them off the hook either for what they did. What I am doing though is taking what they did to me and turning it into something much better. I’m using it to have a deeper compassion for others in this world that are suffering. It has become my tool chest for how I can be there for others that are walking through these dark and lonely paths of healing. As I continue looking at my experiences as my teacher, I am finding that I see things differently. THere were lessons I once missed because I was too focused on the hurt and pain. Please don’t think I’m saying to ignore the hurt and pain because that is only a recipe for disaster if you do. What I’m saying, is that I’m learning to take the hurt and pain and turn it into so much more. The bigger picture though is that by seeing my life’s experiences as my teacher, I not only take back my power, but I see so much more. The possibility of where I can go in life broadens my horizon I cannot yet see. I become more than what was done to me in spite of how painful those experiences were. Let your experiences be your teacher as painful as they may get. At the moment that you do, life will begin to take on a whole new meaning. You will become empowered. You will discover that possibility lies beyond where you thought it did. 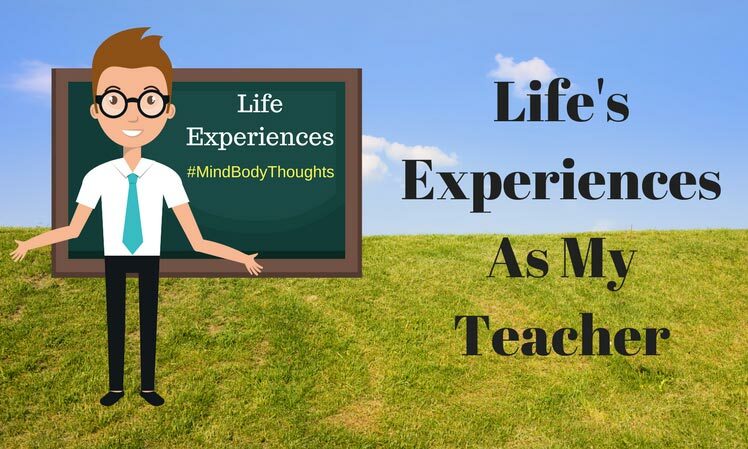 Join me in embracing life’s experiences as my teacher! See what possibilities exist.